Editor’s Note: Welcome to NewBay’s inaugural edition of Need to Know, where we explain complex topics and how they apply to each industry we serve, on our websites and in our magazines. Keep coming back for future topics, to include 5G, cybersecurity, artificial intelligence and more. 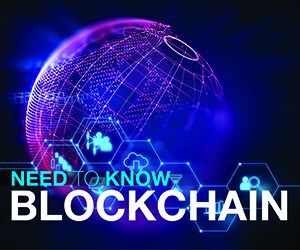 See our full Need to Know for more facts about blockchain. The promise of IoT is that machine-to-machine communication can be programmed and streamlined, and connected devices can be automated. IoT devices can also be programmed to send, receive, and record data. For example, on a connected university or enterprise campus, an IoT system could link network-connected digital signage, smart lighting, HVAC, occupancy sensors, laser projectors, motorized screens, and huddle space technologies. The data harnessed by this IoT system can be a valuable tool to better understand AV usage and design efficacy. An installer or tech manager, armed with insights gleaned from her IoT, can make cogent RFPs or capital requests for AV. IoT can also help economize logistics by distributing data to displays in real-time. Intel forecasts that there will be more than 20 billion connected devices by 2020, so it’s safe bet that, going forward, there will be more IoT/AV integrations, not less. But, where the IoT offers advantages for AV applications, there are also threats. One of the most notable issues with IoT is security: one bad actor can compromise the entire chain. If even one smart lightbulb gets targeted in a vulnerable system, perhaps via botnet attack, it could bring the entire system down. Or a device itself can go rogue. Many experts see security as the biggest impediment to widespread adoption of IoT technologies. Enter blockchain, the decentralized method of protecting data with its built-in, adaptable safeguards. If digital information is the heart of the new AV over IP system, and blockchain protects the integrity of digital systems, perhaps blockchain can be the missing link to reliable security. The process has already begun: Samsung and IBM are using blockchain to create a better solution for IoT management. Who will be next? Have a burning question about blockchain — or maybe request for a different topic you’d like to see us tackle? Email us at needtoknow@nbmedia.com and we’ll put our top minds on it!